Worldwide, found in gold deposits. Metallic gold, included in white milky quartz. Gold included quartz is not enhanced. Gold Included Quartz is a member of the Quartz gemstone family. 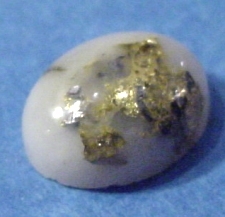 White milky quartz with gold inclusions.